The Palm Beach County Reef Research Team is a group of volunteer sport divers operating under the auspices of the Palm Beach Zoo, a non-profit conservation organization. The Team was formed in 1991 to monitor the artificial reefs on a regular basis, using funding supplied from the State of Florida Fish and Wildlife Conservation Commission. We are currently monitoring 25 artificial and 3 natural reefs out of the 4 inlets of the county. The Team's mission is to observe, collect, document and record scientific data for use in further enhancing our marine habitats. We map, conduct fish counts, and monitor invertebrate status on many of Palm Beach County's man-made and natural reefs, under both funded and unfunded projects. We inform state and local officials and the general public of the results, and of the need for protecting all reefs. You can review some of the data in the Fish Reports and Dive Reports sections of our web site. We hold general and planning meetings monthly which are open to members and the public. The general meetings are held on the second Tuesday of each month, from 7:00 to 9:00 p.m. Besides a short training session on fish or invertebrates, an outside speaker presents a talk on a topic of general interest to all. The general meetings are held at the Vista Center, 2300 N. Jog Road, West Palm Beach, FL. Planning mmeetings are held on the first Tuesday of each month from 7 - 8:30 pm at Duffy�s Sports GGrill, 4746 N. Congress Avenue, Boynton Beach, FL. Participants are invited to meet at 6:30 pm to order ddinner (optional). at the bridge house on Royal Palm reef. Come to our next meeting and join, or sign up online and mail your first year's dues. Lin Creel at (561) 601-5673. Artificial reefs are an excellent way to enhance fish/invertebrate habitat in open barren areas. They greatly increase fish habitat as well as provide recreational opportunities for divers and fishermen. 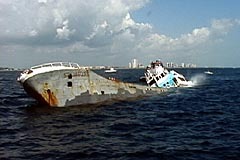 Palm Beach County's involvement in the artificial reef program began in the l960's. The first artificial reef created was the East Palm Beach Reef. It consists of a 165' Navy Patrol Craft (PC l174), a 185' private yacht called the Mizpah, and the 440' freighter Amaryllis. Today, enhanced with two limestone rockpiles and a derelict barge, this site is known as the Palm Beach Corridor. Palm Beach County's Department of Environmental Resources Management is responsible for administering the artificial reef program. Since their inception in 1987, ERM has scuttled 35 ships and barges and placed more than 75,000 tons of rock and concrete structures on the ocean floor throughout the county. Today there are 52 artificial reefs in the county, with more being created every day. For this grant cycle, 25 are being monitored by the Team. The fish quizzes are the heaviest used portion of the PBCRRT website. With written permission from Ned Deloach, the webmaster created (an copyrighted) a set of 23 quizzes to train fish monitors to the level needed to be pass the PBCRRT certification test. The quizzes use photos from Ned and Paul Humann' series of Reef Fish Identification Books, and are self scoring. You will be told to study the Humann and Deloach books. Hit the Fish Quizzes item on the left menu and have at it the fun way. 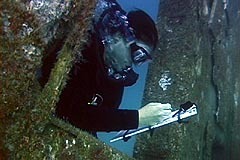 Mapping and underwater surveying techniques.